I think this may be the most ridiculous (and most delicious) thing I’ve ever done. Scotch Creme Eggs! In case some of you non-Brits are unaware, Scotch eggs are usually savoury – a boiled egg covered in sausage meat and breadcrumbs. But since boiled eggs and sausage meat don’t really float my boat, I made a few substitutions. Perfectly normal ones. As you can imagine, these babies are crazily delicious. Sprinkles, goood. Brownie, gooood. Creme Eggs, goooooood. 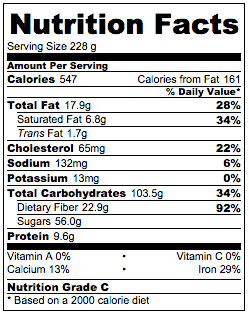 I’ve included the nutritional information for these Scotch Creme Eggs below, as I do with every recipe – but do yourself a favour and don’t look. Trust me. Really, just don’t look. These aren’t exactly supposed to be providing you with your daily vitamins and minerals, they’re supposed to be delicious – and delicious, they are. Okay, if it was possible to overdose on calories, this would probably be how you’d do it… but ignore that fact for now and get stuck in. 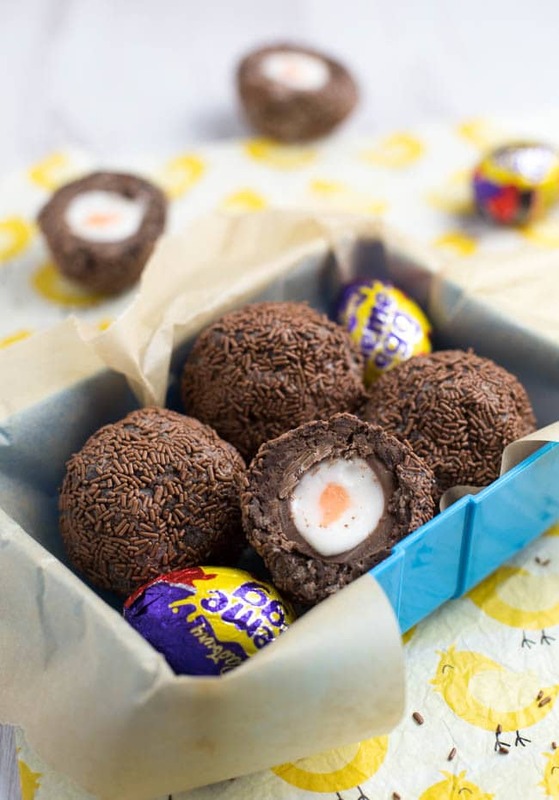 Scotch Creme Eggs are much, much easier. Since I wasn’t exactly aiming for an upper class dessert here, I started with a shop-bought tray of brownies. Make your own if you can be bothered; buy them from the supermarket if you’re eager to just get stuck in. You need to crumble the brownie up, then mix it with some vanilla buttercream to make it nice and malleable. Again: make your own if you want to, don’t if you don’t. I didn’t. 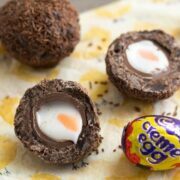 Mould the brownie ‘meat’ around a Creme Egg –> roll in chocolate sprinkles –> face plant. And that is how I will be spending the next few months. Add the thoroughly crumbled chocolate brownie to a large bowl, and add the buttercream. Mix thoroughly. 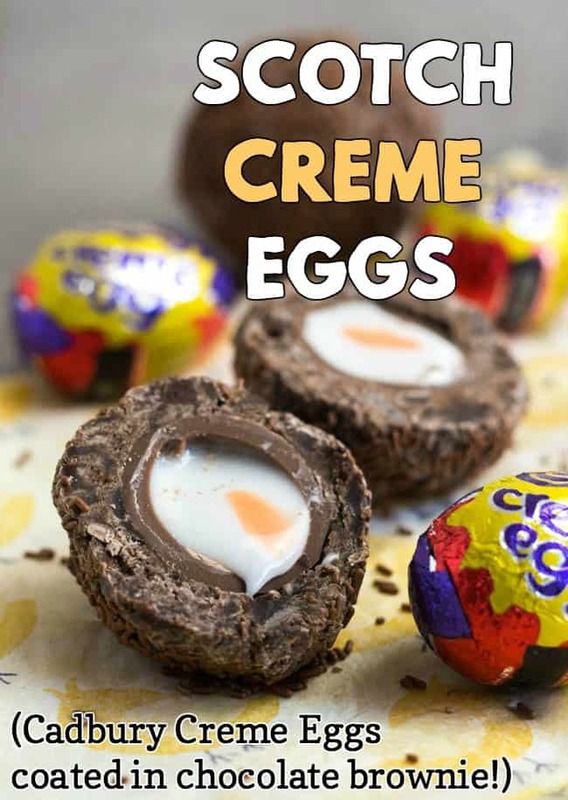 Take a small amount of the brownie mixture, and mould it around a Creme Egg. Continue adding more brownie until the entire egg is covered. 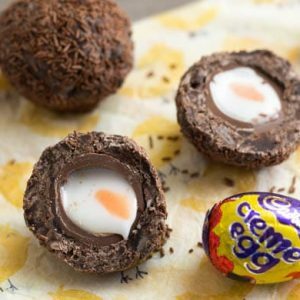 Roll the egg in chocolate sprinkles. Repeat with more Creme Eggs until the brownie mixture is all gone. I managed to make 7, but it depends how thick your brownie layer is. Wow these are amazing! 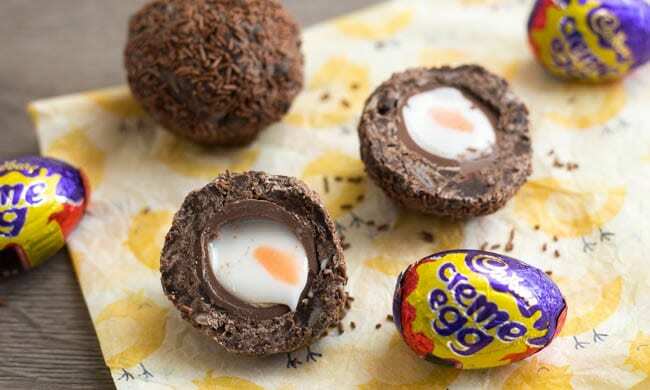 I don;t like the regular creme eggs so I used the chocolate filled and the caramel filled ones instead and they were to die for but I don’t recommend eating more than one or you may go into a sugar coma! Sprinkles, goood. Brownie, gooood. Creme Eggs, goooooood. What’s not to like? Custard? Good Jam? Goood. Meat? Gooooood. A cafe near us has started doing these and I was going to swing by and pick them up – but maybe I’ll just make my own! OMG! I can’t decide if you are mad or brilliant! This appears to have gone viral, judging by the amount of times I’ve seen it on my Facebook feed over the past 48 hours! 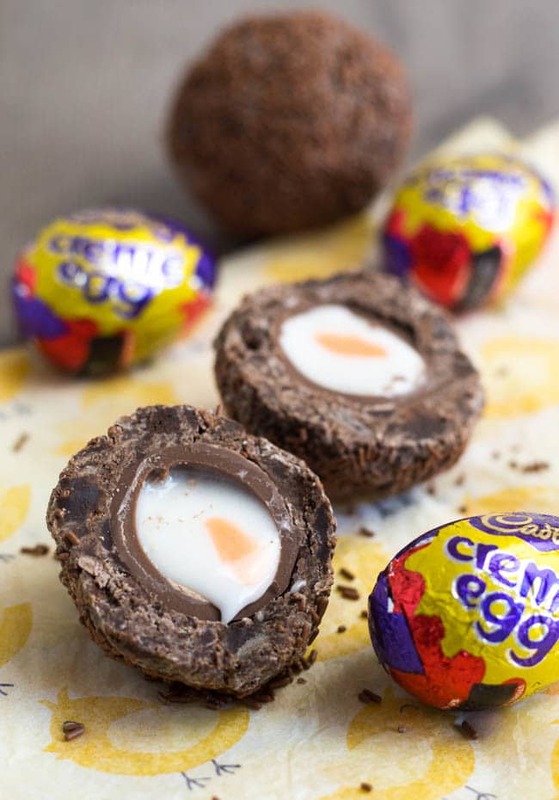 I dislike creme eggs, but I’m wondering whether it might be nice made with truffle eggs, which I do like…..
Oh really? I’ve literally only just shared this on my FB page, maybe it’s someone else’s version you’ve been seeing :) I’m sure it would be great made with any kind of egg you fancy! Clever idea, Becca. Would be fun to see people open them up!